23junAll DayThe Summer Cornishman - Steam HauledA Sunday excursion to Cornwall hauled by No. 60163 'Tornado' including several stops to admire the steam loco whilst it takes on water. A choice of off train options. Motive power is expected to be a steam locomotive throughout with No. 60163 ‘Tornado’ planned, subject to last minute availability. Join us for a memorable trip to the scenic splendours of Northern Scotland, travelling in classic First Class carriages. Enjoy freshly prepared on-board meals served at your seat, a choice of off-train options and a comfortable overnight hotel. First class rail travel aboard our special train, your choice of optional activity each day, hotel transfers and three nights hotel accommodation in a shared twin or double room (a supplement applies for single room occupancy). On train meals and refreshments as described. Breakfast at the hotel Saturday morning. We ask that your choice of off train option for each day is advised at the time of booking. 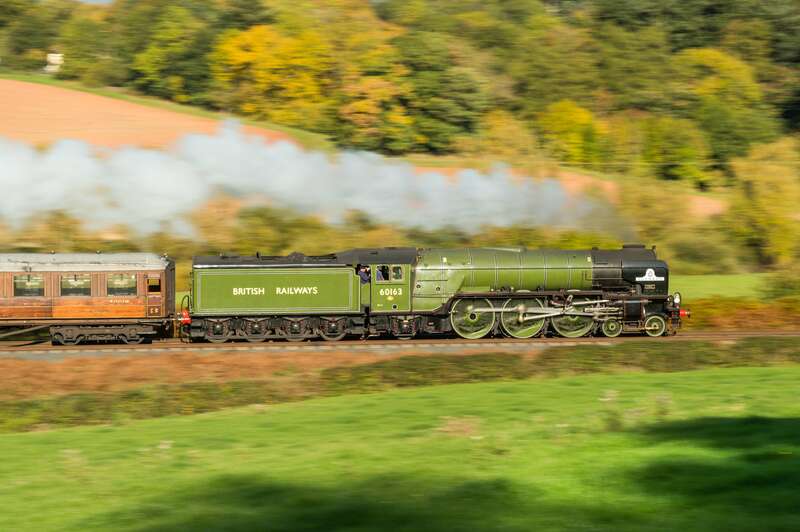 The day starts with our special train setting out from our departure stations, with a traditional English Breakfast being served with a welcoming glass of champagne. Something a little lighter will be served for those joining the train later. Luncheon will be served before a break in Carlisle. We then head into Scotland, with evening dinner as we head into the Highlands on our way to the Macdonald Aviemore Resort Hotel for the three night stay. Join our special train for a fantastic journey, first over the high hills to Inverness, then along the spectacular line across the mountains to the West Coast. A light lunch will be served en-route. From Kyle of Lochalsh road coaches will take you across to the Isle of Skye and back to visit Portree, before returning to Aviemore along the same way as our outward route. Option B – Five Sisters and a Monster! Your day will start from the hotel with a guided road coach tour – firstly to Fort Augustus for a Loch Ness cruise, followed by a lunch. Then you will travel along the Five Sisters of Kintail road to visit the iconic Eilean Donan Castle, before reaching Kyle of Lochalsh for the return to Aviemore aboard our special train. As Option A to Kyle of Lochalsh then, after a short coach transfer, we enjoy a cruise on sea water Lochcarron (look for the seals!) and a short break in Plockton village. The cruise boat is a 60 seater and has full rain cover. Enjoy the scenic rail journey from Aviemore to Kyle of Lochalsh and back (as options A and C above) but spend the afternoon ‘doing your own thing’ in this quiet west coast community overlooking the Isle of Skye. A leisurely hotel breakfast will be taken before taking a road coach up Cairngorm mountain for the views and then a visit to the Cairngorm Reindeer Herd. Lunch will be back at the hotel. The Strathspey Railway features in the afternoon with a steam hauled return ride. Afterwards you can then choose to explore Aviemore town and its shops or return directly to the hotel. Evening Dinner back at the hotel will round off your lovely day. Early evening will see most of the guests (except option E) back on the train for the scenic journey from Kyle of Lochalsh to Aviemore, with Evening Dinner served along the way in your travelling restaurant. Today, our special train heads for the far north of Scotland, with Breakfast served as we take this twisting single line route through the wonderful scenery. There are numerous options to choose from. Then, at the end of the afternoon, we return to Aviemore aboard our train with Evening Dinner enjoyed as the grand scenery continues to pass your carriage window. At Lairg join a coach with a guide for the journey. We will take stops along the single track A836, with wild and natural beauty all around. Then along the undulating north coast to Bettyhill for a lunch stop and on to Thurso before re-joining the return train. Leave the train at Helmsdale for a guided coach tour along the coastal A9, first to the Laidhay Croft Museum and lunch, then we visit the nearby Dunbeath Castle Gardens. Afterwards we continue onto Wick to re-join our homeward train. We arrive into Thurso aboard our train, but rejoin it later from Wick. In between we travel by guided coach tour to visit both the most northerly point of the Scottish mainland – Dunnet Head – and the ‘last and first’ that is John O‘ Groats. 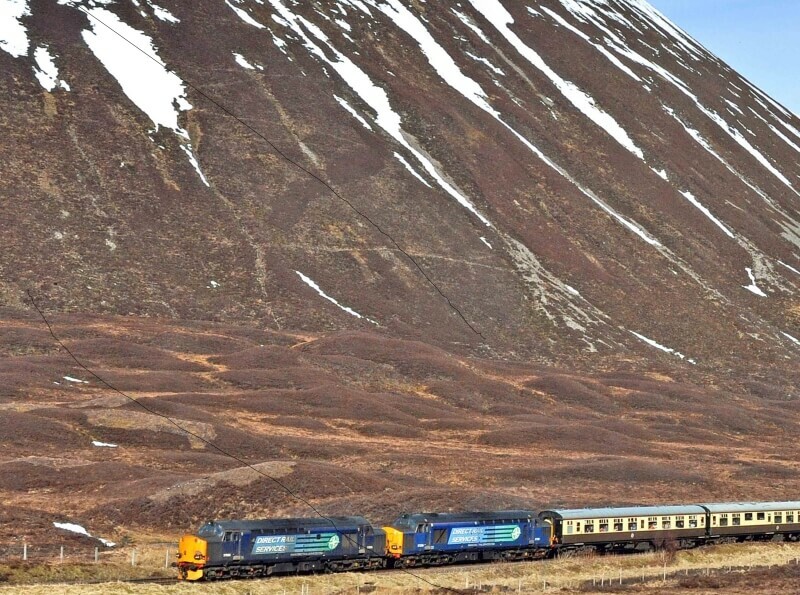 If you would like to stay with the train for its full day’s journey (Aviemore – Thurso – Wick – Aviemore) then this is the option for you, with a two hour break in Wick at line’s end. This is a repeat of Saturday‘s Option E – A leisurely hotel breakfast will be taken before taking a road coach up Cairngorm mountain for the views and then a visit to the Cairngorm Reindeer Herd. Lunch will be back at the hotel. The Strathspey Railway features in the afternoon with a steam hauled return ride. Afterwards you can then choose to explore Aviemore town and its shops or return directly to the hotel. Evening Dinner back at the hotel will round off your lovely day. Sadly, it’s time to head south. We leave Aviemore whilst enjoying a traditional cooked Breakfast as our train heads over the Druimuachdar Pass and through the Killiecrankie Pass to Perth. Then its around Glasgow into the Southern Uplands to reach England, whilst your four course Luncheon is being enjoyed. All too soon we will reach the set down stations to complete a marvellous weekend. If you are travelling well to the south a supper will be served. Wherever you leave us we genuinely hope you will have a weekend full of delightful memories to look back on. ^We are unable to pick up from Dorridge on our outward journey and instead will pick up from Solihull. A non-refundable deposit of £150 per person is payable at time of booking, with the balance payable six weeks before the day of running. For parties of 3, a deposit of £600 is taken to reserve the fourth seat. If you book a party of 4, you will automatically be sat together.